Wickaninnish Beach at Wickaninnish Bay marks the southern end of Long Beach within the Pacific Rim National Park. It sits just barely above the 49th parallel between Portland Point and Quisitis Point. Wickaninnish Bay was also known for many years as Long Bay. Wickaninnish is the hereditary name of the principal chief of the Tla-o-qui-aht first nations. The name was sometimes used to refer to the Tla-o-qui-aht people in general. Chief Wickaninnish wielded great power over Clayoquot Sound in the 1700’s. He was widely respected and sometime feared. Wickaninnish Bay was the location of the original Wickaninnish Inn. Its authentic west coast rugged charm made it a favourite hideaway for many including a Hollywood star or two. The building is now the present day Interpretive Center for the PRNP and has a restaurant that operates during the summer high season. Wickaninnish is a beach explorer’s paradise. Its location at the southern end of the 16km stretch of Long Beach allows it to act like a damn — collecting flotsam, jetsam and driftwood unlike any other beach in the region. As you wander your way north through this treasure trove you see the beach dunes in the distance. These dunes are a summer playground that can make a 60 year old giggle like a school girl. To climb their heights and roll around in them on a hot summer day is truly a blast. 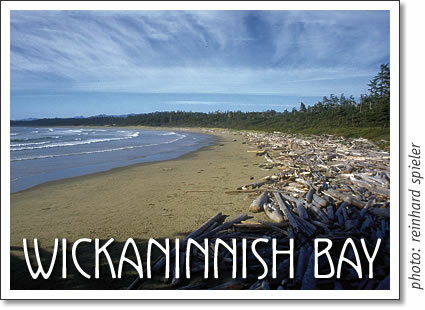 Located within the Pacific Rim National Park, Wickaninnish Bay is by designation a nature preserve. The further north you travel from the parking lot the more wild the beach becomes. Beware of wild life and always respect the shore birds by keeping your dogs on a leash. Wickaninnish Bay has a westerly exposure which offers it off shore wind surfing conditions during the predominantly south easterly winter months. It can hold a mid sized wave cleanly and generally works best on an incoming to high slack tide. Tofino beaches: Wickaninnish Beach - the southern end of Long Beach at Wickaninnish Bay in the Pacific Rim National Park near Tofino, British Columbia on Vancouver Island, Canada.